St. Monica presents the Class of 2015! 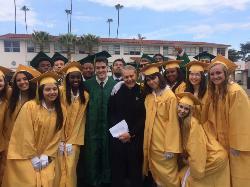 On Thursday May 28th, St. Monica Catholic High School held its 77th commencement ceremony for the class of 2015. In front of hundreds of friends and family, the Class of 2015 graduated on the LMU campus. Congratulations to the newest members of the SMCHS alumni association! 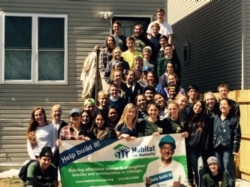 Nearly 40 students and 8 chaperones participated in this year's effort in Chicago as part of the school's Habitat for Humanity club. The club's mission is to partner with Habitat for Humanity affiliates locally and across the United States in advocating, educating, building and fundraising to eliminate poverty housing. To read the club's blog about their most recent effort in Chicago, click on the linked page in this news story. 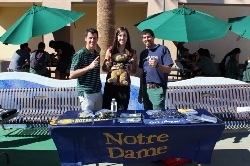 On Wednesday, November 5th the faculty showed their school pride and renewed some friendly rivalries during the annual St. Monica Catholic High School College Fair! 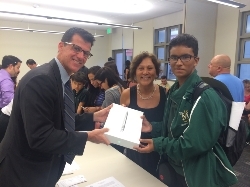 Students in all grade levels will now utilize MacBooks as part of their daily school routine, with continued access to cloud-based storage, paperless homework, and online textbooks being implemented as the program grows. 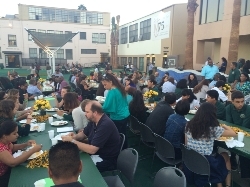 On Monday August 18th, St. Monica Catholic High School welcomed the class of 2018 to campus. St. Monica Catholic High School and Elementary School students show their happiness at this year's S.M.A.S.H. Dinner and Auction!